Every so often, a new version of the Android tablet’s operating system becomes available. It’s an Android update because Android is the name of the operating system, not because the Android tablet thinks that it’s some type of robot. When an automatic update occurs, you see an alert or a message indicating that a system upgrade is available. A good way to do this is to choose Restart & Install and — as long as the tablet has a good charge or is plugged in — proceed with the upgrade. Yes, you can put off an update by simply dismissing the update notice: Touch the Home icon. However, it is strongly recommended that you upgrade. You can manually check for updates: In the Settings app, choose About Tablet or About Device. (On Samsung tablets, look on the General tab in the Settings app.) Choose System Updates or Software Update. When the system is up-to-date, the screen tells you so. Otherwise, you find directions for updating the Android operating system. Touching the Check Now button isn’t magic. When an update is available, the tablet lets you know. Non-Android system updates might also be issued. For example, the tablet’s manufacturer may send out an update to the Android tablet’s guts. This type of update is often called a firmware update. 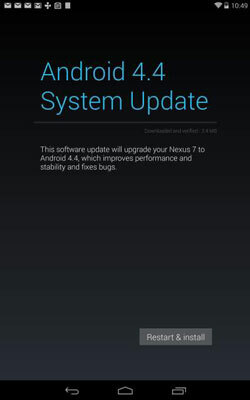 As with Android updates, you should accept all firmware updates.